DxO Labs takes an unorthodox approach to software development. It solves problems, making its tools more and more useful. Sometimes that means the tool gets a little less powerful, a little less theoretical and a touch more natural. Which his precisely what has happened in the newest version of ViewPoint, the company's lens distortion tool. Distortion correction has been making the rounds this year, with new tools in Adobe Camera Raw (for Photoshop and Lightroom). But DxO Labs ViewPoint remains the most effective approach. Nothing against ACR's four buttons (from Auto to Manual) and Reanalyze but ViewPoint lets you point out what you want to straighten before doing the heavy lifting. That feels more direct. ViewPoint's approach also seems to deliver better results on more complex images that take a little human judgement to improve. ViewPoint also does more than Adobe Camera Raw, as we pointed out in our story Correcting Distortion In ViewPoint, Lightroom. In fact, it's the only tool that corrects volume distortions of either spherical or cylindrical oriented. But sometimes doing more means doing less. As we review the new features in ViewPoint 2, you'll see what we mean. ViewPoint 2. A familiar interface with a few new wrinkles. Distortion correction has been improved by including DxO Optics modules, which number about 15,000 camera/lens combinations. In fact, when we opened our first image in ViewPoint 2, it warned us that an optics module should be downloaded to process the image. So we did. Quickly, painlessly. And ViewPoint 2 made the correction instantly. Distortion. Automatic (left) after we downloaded the appropriate Optic module and Manual mode options. You can also manually correct barrel, pincushion and fisheye distortion even if your camera/lens combination doesn't have an Optic module. And you can rachet the correction back with the Intensity slider. That can make a severe wide angle look more like a normal wide angle, where the distortions are not quite so disturbing. Corrections. The revised right-hand menu. The small left-pointing arrow is Reset. Scroll to see everything. Perspective correction, which can be complex, now has an eight-point tool joining the 4-point correction tool and parallel lines tool. So now you can adjust perspective it two different planes at the same time. With the new Natural Setting, we get to the "less" part of ViewPoint, which automatically sets the Intensity of the correction to just 75 percent for a more realistic look. As with the Distortion Intensity slider, this is particularly helpful with very wide angle lens shots, bringing them into the believable, digestible world of normal wide angle lens shots. When you apply a spherical correction, you can now elect to retain rather than crop the empty spaces in corners. 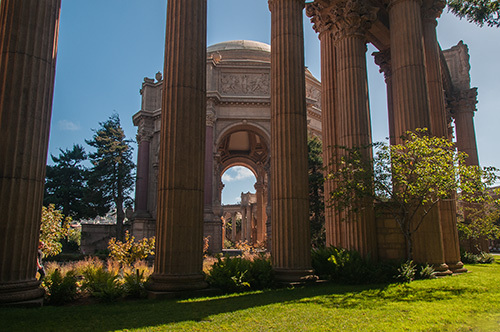 With Photoshop's Content Aware Fill, those empty spaces can be rendered with credible content, avoiding the tighter crop that would otherwise be required. Often that tighter crop cuts off some important detail in the main subject or comes too close for comfort. Now you have the option of retaining the original dimensions to retouch later. Hat Trick. The original 18mm focal length image suffers vertical lines falling in on themselves. 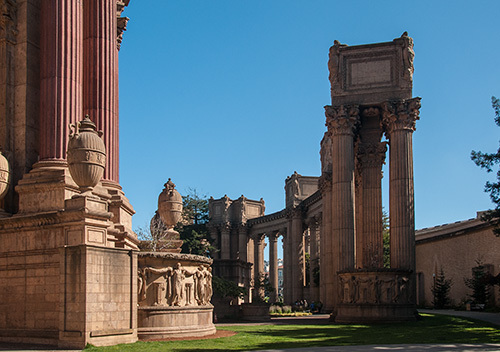 Adobe Camera Raw 8.2 does a nice job straightening the columns but notice the spherical distortion in the urns. That's handled much better in ViewPoint 2. More Columns. Another original 18mm focal length image with converging verticals. For this one, the Intensity slider was dialed down for a more natural look. 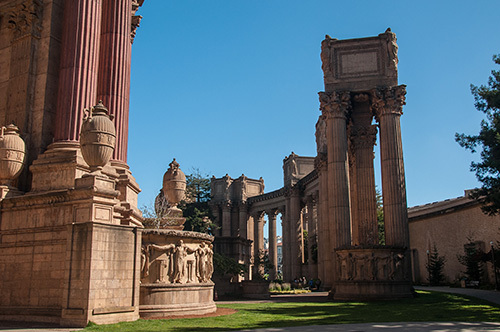 So the Palace looks good even if the columns at the edges lean in a bit. New workflow improvements include sample images to help you recognize common distortion problems and the tools that ViewPoint provides to correct them. Quick access to the last images opened is also new. Contextual help message (like that warning to download an Optical module) have been added. Contextual Help. We're advised to download a free Optical module. And plug-ins for Elements and Aperture are new, too, joining Photoshop and Lightroom plug-ins. If we have a gripe about ViewPoint (and other DxO software) it's simply that it writes its log files in the ~/Documents folder rather than the ~/Library/Logs folder, like everyone else. Small gripe, but it should be fixed. Oh, one more while we're at it. Seems like when we used the Photoshop plug-in, all the colors so carefully derived in Adobe Camera Raw became oversaturated in the ViewPoint display. Optic Modules. ViewPoint found and downloaded the module we needed. ViewPoint doesn't affect saturation and when the edited image was returned to Photoshop, the saturation didn't come with it. But it was startling. Hmm, well, still one more thing. When you set your perspective points you can Preview the effect before you actually Apply it. But if you don't like what you see, you Reset. Unfortunately, reset doesn't reset the previewed image correction. It resets the tool. So you have to repositioned your perspective points. We'd prefer to go back to our previous positions even if they weren't optimal. You really aren't in ViewPoint long enough to be annoyed by any of these things but if anyone's keeping a list of tweaks to make, here's three. DxO ViewPoint 2 [MW] is available in the DxO Labs online store and at photo resellers. Our affiliate B&H has ViewPoint, for example. You can download a trial version of ViewPoint 2 that expires in a month. If you purchased ViewPoint on or after Aug. 1, you can upgrade to version 2 at no charge. 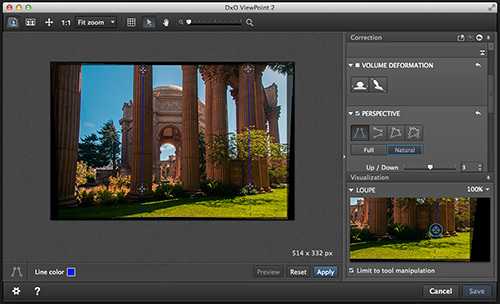 This upgrade is free to all owners of DxO ViewPoint who purchased a license on or after Aug. 1. Our minor gripes aside, ViewPoint 2 gives you significant control over optical distortion. With the integration of Optics modules, there's an immediate improvement on the image but you don't have to stop there. Unlike other tools, you can deal with spherical distortions and you can now correction perspective in two planes. And you can dial these correction back with the new Intensity slider to make them a little more natural. All that -- including a little less -- adds up to a nice upgrade to a unique product. PARIS, France -- DxO Labs announces the immediate availability of DxO ViewPoint 2, its software dedicated to fixing problems with perspective and to correcting volume deformations. This version includes an exclusive new tool for fixing convergent lines in even the most complex images. For perfect images, the software also uses the precision of DxO Optics Modules to correct optical distortions. Increasingly versatile, DxO ViewPoint 2 extends its compatibility to include Adobe Photoshop Elements and Apple Aperture. Based on DxO Labs' exclusive correction technologies, DxO ViewPoint 2 offers simple visual tools that let users easily and efficiently correct two phenomena that frequently confront photographers who shoot with wide-angle lenses: volume deformation of subjects on image edges and convergent lines. 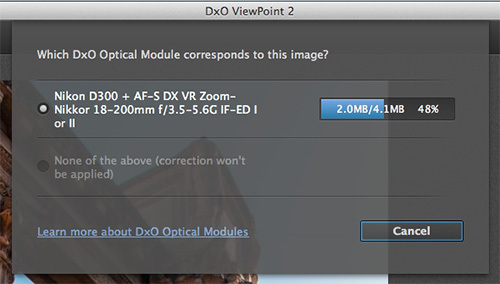 DxO ViewPoint 2's simple, visual tools let users easily fix all kinds of perspective problems. The software now offers a new, exclusive 8-point mode that lets users fix any convergent line in the image, regardless of its position. Benefitting from all of DxO Labs' expertise in lens analysis, DxO ViewPoint 2 now corrects distortion. Thanks to DxO Optics Modules, users can automatically apply corrections that are perfectly adapted to their equipment. Developed in the laboratory following an exclusive calibration procedure, DxO Optics Modules contain extensive information about the characteristics of each combination of camera and lens. This unique database, which today includes nearly 15,000 Optics Modules, enables DxO ViewPoint 2 to automatically provide high-quality corrections for each type of distortion. 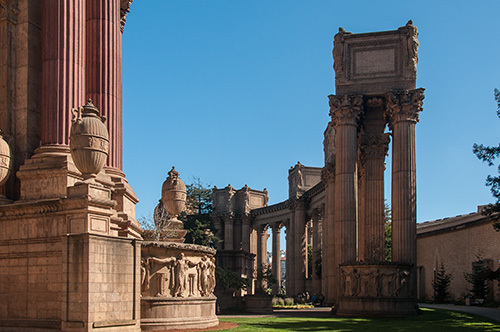 This upgrade is free to all owners of DxO ViewPoint who purchased a license on or after Aug. 1. A fully-functional trial version of DxO ViewPoint 2, good for one month, is available on the DxO Labs Web site.